A few days ago, while on the 80 bus heading south on Parc, a perfect photographic opportunity presented itself to me: sitting in front of the long-under renovation Mont-Royal monument, on the back of a flatbed truck, were two of the four bronze lions that lie in repose at each corner of the monument. It was as though they had been taken for a ride and were now just hanging out of the back of the truck. Anyway, of course I didn't have my camera with me, and when I returned the next day they were back in their spots, looking out regally on the city as though they had never left. 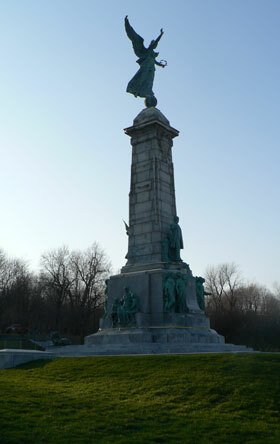 We know differently, however, because the refurbishment of the Georges Etienne Cartier monument, like the redesign of the intersection of du Parc and des Pins, has taken what seems like forever. And, now, at last, it looks as though they're ready to remove the temporary fencing that has been up for a couple of years. Just in time for winter. There's no way it needed to take as long as it did to fix, but, that said, and provided they are almost finished and aren't doing some other minor job that will take eight more months, it looks fantastic. The lions, untarnished by weather, bird poop and children's fingerprints, gleam. The stonework seems crisp and the monument itself is immaculate. Come spring, it will be a glorious site for hippies to play bongos and sell handmade juggling balls. My favourite conspiracy theory about all of this, though, was suggested to me this week by an MP contributor, who perhaps doesn't want to be named in case Mayor Tremblay sends out his goons. She noted that it's interesting that the completion of the intersection and the restoration of the monument, both, I stress, big features of Ave. du Parc, have happened just as the plan to rename the street emerged. Almost as though the mayor and the city were planning some kind of gala PR thing: here's our now more glorious, centrepiece street. Oh, coincidentally, we're renaming it in honour of some guy. Was the completion of the monument renovation delayed for this reason? More often than not over the past few years, I noticed that the renovation project seemed to have almost been abandoned; they'd fenced it off, dug some stuff up, and then disappeared. OK, as conspiracies go it's pretty benign, but it's nonetheless an interesting speculation. My understanding was that they had made a bad call about how much the foundations of the monument needed to be repaired, and were planning to just remove some of the stone and statuary, clean it off, and put it back in place. Upon opening it up and finding internal problems, they had to up the budget and fix the structure (delays delays) before finishing the job. It wasn't the most expensive project in the world, only a few hundred thousand IIRC, which is probably another reason why it took so long. It's cheaper, of course, to have a few people working on something every so often than to hire a lot of (pretty highly skilled) people to get it done quickly. There's a lovely Marc-Aurele Fortin painting of the monument when it was first built, which is on display at his eponymous museum in Old Montreal. Don't do a Google image search to try and find this painting, as you only get images of other Fortin works and pictures of Serge Menard, which are terrifying. Haven't noticed/seen the revamped monument yet, but I'm sure that by the time I do it will have been tagged with multiple squiggly signatures. I don't usually support conspiracy theories, but I think this one has real merit. I'm highly suspicious of the timing. Guess we'll just have to wait and see what happens after tonight's vote on the name change.